Become a highly qualified professional, thereby allowing you to work in areas realated to scientific and technological research and innovation in food and gastronomy. The culinary, food and catering sector is constantly developing. As a result, there is a need for professionals who are familiar with, and apply valid research tools in order to allow the sector to move forward in any of its forms. In this University Master's Degree the first official Master to offer specialisation in research in the culinary, hospitality and food sector, you'll learn about the research methodologies used in the gastronomy sector and how to apply them in order to create innovative business propositions, managing multi-disciplinary teams. You'll also gain expertise in the development of new products and services, with a scientific-technological base. You'll acquire in-depth knowledge of the market and you'll be able to identify new business models. This Master's Degree will also open the doors to teaching and doctoral studies. This Master's Degree will become the access platform to develop your future career in the area of research and innovation in new products and services, as well as teaching and doctoral studies. 90 credits, which include the preparation of a Master's Degree final project either at a company, technology centre or R&D department at a university. Optionally, this can be done abroad. Acclaimed national and international professors and visiting professors, with extensive teaching and professional experience in the different areas of the programme. • Duration: 90 credits. 2.250 hours. • Registration open on 1st December! • The next Master's Degree course is set to commence in October 2019. You'll learn about the research methodologies used in the culinary sector and how to apply them in order to create innovative business propositions. You'll gain expertise in the development of new products in the food and gastronomy sectors. You'll acquire a broad scientific-technological knowledge base, in order to create coherent, suistainable propositions. You'll learn about current food trends in order to manage research and innovation in the gastronomy, food and catering sector. You'll learn how to design dishes and menus, discovering the sensory and aesthetic aspects, as well as their nutritional values. You'll learn from the best expert university professors adn top level entities. You'll prepare your Master's Degree final project at restaurants, research centres and leading national and international industries. You'll visit technology centres, R&D departments of companies in the food sector, and R&D teams at haute cuisines restaurants. You'll attend culinary conferences and will actively take part in entrepreneurship initiatives and the creation of new businesses such as Culinary Action. You'll be part of the Basque Culinary Center, the only Faculty of Culinary Sciences in Spain that is recognised and supporter by the world's most influential chefs. You'll get all the training that a professional focussed on the food and gastronomy sector may require, identifying new business opportunities. 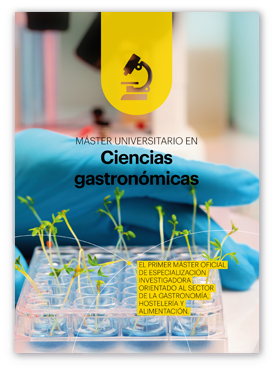 This Master's Degree is directed at university graduates who are interested in research into the development of new products, and in everything related to the gastronomy, food and catering sectors. Gastronomy, Nutrition, Food Technology, Innovation in Food Processes and Products, Biochemistry*, Pharmacy*, Biology*, Chemistry*, Environmental Sciences*, Anthropology*, Applied Sociology*, Biotechnology* and Business Management and Administration*. *Supplementary training will be given in some specific areas. The Master's Degree is taught in Spanish and English. Therefore, students need to certity that they have a level equal to or higher than B2 in English and, for those students whose mother tongue is not Spanish, then, in addition to the requirement level of English, a level of Spanish that is equal or higher than DELE B2. The Master's Degree study programme gives students overall competencies, supplemented with a period of work placement during which the final project is prepared. During the second year of the Master's Degree, students shall spend at least 5 months (30 ECTS) preparing a final project. This can be done either in a company, technology centre or R&D department of a university, with the support and guidance of professors at the Faculty and also company tutors. This work placement will allow students to learn about and gain first-hand experience of the real world of food and cuisine, by carrying out real-life projects. Master's Degree final project at a company or university, that may be located in the student's country of origin. Mondary to Friday, in the morning. The registration period is open until there are no places left. • The International Forum of Entrepreneurs Culinary Action! Based on Mondragon Unibertsitatea educational model, Basque Culinary Center model puts students centre stage, focussing on their personal, social and professional training. It is an extremely practical model based on competencies. How do students learn at Basque Culinary Center? The programme's team of staff comprises PHD professors with extensive professional and teaching experience in the different areas of knowledge forming part of the Master's Degree: Research & Innovation, Strategy, Produce-Service Design & Development, Culinary Sociology & Management. PHD in Physics Biochemistry by University of East Anglia (Norwich, United Kingdom) and researcher at the Institute of Food Research BBSRC, United Kingdom. He has been Director of the Characterisation and Microstructural Design Laboratory of AZTI-Tecnalia Food Research and Technology Center. Currently, Dr. Arboleya is the Technical Coordinator of the Master's Degree in Gastronomic Sciences, Coordinator of the Food Industry specialization itinerary of the Degree in Gastronomy and Culinary Arts of BCC and Coordinator of the Sensorial Perception and Customer Preferences itinerary of BCC Innovation. He is also Chief Editor of the International Journal of Gastronomy and Food Sciences magazine. Doctora en Farmacia habiendo realizado una estancia posdoctoral en la Universidad de California Los Angeles y en Irvine. Ha recibido el Premio Ortiz de Landázuri por un proyecto de Investigación relacionado con la Nutrición y la fisiología intestinal. Es investigadora principal de varios proyectos nacionales y coordinadora científica de SIforAGE. Doctor en Bioquímica con amplia experiencia en proyectos de Biotecnología. Ha trabajado más de 10 años en Inasmet y ha dirigido 3 Tesis Doctorales. Ha sido Investigador principal de 4 proyectos nacionales y ha coordinado la iniciativa Gipuzkoa Brain Research. Desde 2011 es profesor e investigador en Basque Culinary Center sobre ciencia y cocina. Doctor en Nutrición Humana. Ha trabajado en proyectos internacionales con técnicas comportamentales, sensoriales, psicológicas y fisiológicas. En la actualidad trabaja en una línea de investigación sobre el efecto de la cocina en los hábitos dietéticos de los niños. Es directora del grupo de Diseño y Desarrollo de Nuevos Productos Alimentarios en el Functional Food Forum de la Universidad de Turku, que estudia la influencia del entorno en una experiencia culinaria. Mantiene una continua colaboración tanto con la industria alimentaria como con el mundo gastronómico, creando un triangulo muy interesante en el desarrollo de sus productos. Un ejemplo son los estudios que realiza combinando música, color y emoción. Es actualmente Profesora del Grupo de Marketing y Comportamiento del Consumidor en la Universidad de Wageningen, aunque ha formado parte durante años del prestigioso grupo de Charles Spence en la Universidad de Oxford (Reino Unido). Ambos son autores del famoso libro The perfect Meal: the multisensory science of food and dining. Investigador del CNRS (Centro Nacional para la Investigación Científica), imparte clases en diferentes universidades como la Universidad de la Sorbona, París (Francia). Es un colaborador asiduo de Herve This (padre del término Gastronomía Molecular). Catedrático en el Departamento de Ciencia de los Alimentos de la Universidad de Copenhague. Participó en la reuniones sobre Gastronomía Molecular en Erice (Sicilia) en 1999 y 2002, y a partir de entonces ha colaborado con diferentes grupos europeos que trabajan en el ámbito de la ciencia y la cocina. En este ámbito ha desarrollado proyectos sobre investigación científica de procesos culinarios y colaborado con varios cocineros de restaurantes de alto nivel. Ha sido el coordinador de la red nacional de grupos de investigación “INDAGA (Investigación, Innovación y Desarrollo Aplicados a la Gastronomía)”, dedicada a la ciencia y la gastronomía. Doctora en nutrición, tecnología de la alimentación y biotecnología. Trabaja en la investigación sobre el peso que tiene en los consumidores la información externa sobre la interna en el momento decidir qué alimentos consumir. Concretamente, investiga cómo las pistas contextuales (características del producto, diversidad, disposición de los productos, información del punto de venta) e influencias sociales (costumbres, valores culturales, boca a boca) pueden limitar los efectos de los conocimientos previos de los consumidores (creencias, actitudes y gustos), así como sus propios objetivos y planes en sus comportamientos. Doctor Ingeniero. Consultor en el campo de la implantación de modelos y sistemas de innovación empresariales, docentes, sociales, sanitarios y en especialmente en el ámbito de los servicios. Dirige proyectos de innovación en gestión en ámbitos como la organización de competencias, la gestión por valor, la implantación de técnicas de activación del conocimiento y cooperación, y técnicas de mejora de la operativa de las organizaciones. Ha sido profesor asociado en Mondragon Unibertsitatea, EHU-UPV y Universidad de Navarra. Doctora en Ciencia y Tecnología de los Alimentos. Pertenece a la unidad docente de Nutrición y Restauración Colectiva de la Universidad Politécnica de Valencia. Entre las líneas de investigación en las que participa se encuentran los relacionados con las nuevas tecnologías aplicadas a Nutrición comunitaria, los relacionados con la tecnología culinaria y la restauración colectiva, así como la cocción y fritura a vacío que ha dado lugar a numerosas publicaciones y tres tesis doctorales y al desarrollo de la Gastrovac, equipo de cocción a vacío, que en la actualidad se encuentra en las cocinas de restaurantes en todo el mundo. Es editora del área de ciencia y cocina en el Journal Culinary Science and Technology y miembro de la Sociedad Española de Nutrición Comunitaria. Doctor en Administración de Empresas, profesor en muy reconocidas instituciones universitarias. Vicerrector de la international Academy of Management y miembro de los Consejos de Administración de empresas como Epikurean Hospitality en Tailandia y Altia Consultores en España. Además, forma parte del Consejo Asesor de Delaware (España) y es patrono de la Fundación de Arte Contemporáneo NMAC (España). Es autor de diez libros de referencia en el panorama del management español y escritor habitual de artículos en prensa de negocios. Ha colaborado con Consejeros Delegados en la definición de la estructura organizativa y del proyecto de transformación de numerosas empresas punteras en sus sectores correspondientes. Prestigiosa científica que desarrolla parte de su actividad investigadora en colaboración con el chef Mario Sandoval, logrando crear nuevas texturas a partir de hidrolizados de proteínas de huevo, trabajos presentados en las últimas ediciones de Madrid Fusión, y que el CSIC presenta como ejemplo de ciencia e innovación aplicado a la sociedad. Recientemente ha creado un equipo de investigación llamado “Bioactive Gastronomy”. Doctora en Análisis Sensorial por la Universidad de Santiago de Compostela. Experta en investigación sensorial y percepción del consumidor con amplia experiencia en docencia e investigación en proyectos relacionados con el análisis y percepción sensorial. Colabora estrechamente con empresas de la industria alimentaria y con el sector gastronómico. The centre has special financing agreements with a number of financial entities (maximun financing option of 6 years). Given the official nature of the programme, students legally resident in Spain can apply for grants or state aid. Likewise, international students can apply for financing and grants from institutions in their country of origin that support study abroad. Students can apply for a Erasmus+ grant. These grants promote international mobility and work placements within Europe. In order to help students look for a job, during or after their studies, the students on this Master's Degree course will be given information on any job offers received by the Faculty. Likewise, during their stay, students can apply for the study-work grants offered by the Faculty, and work in the various departments: R&D, operations, cafeteria, etc. Basque Culinary Center admission system is directed at ensuring that our students have the academic level and personal competencies required to sucessfully pass the innovative and demanding study programme. A copy of the ID or passport should be uploaded in order to validate the registration. • Certified photocopy of the university degree or diploma, confirming that the studies have been successfully completed. • Certificate from the university of origin confirming that the student is eligible to study at Master's Degree level. • Certificate from the university or origin confirming that the student is eligible to study at Master's Degree level. This certificate must be authenticated through the appropiate diplomatic channel. • Those students whose mother tongue is Spanish, must provide an official certificate stating that their level of English is equal to or higher than B2 (Common European Framework of Reference for Languages CEFR). • Those students whose mother tongue is not Spanish, in addition to the certificate of English, must also certify that their knowledge of Spanish is level DELE B2 or higher. • Letter of motivation, witten in Spanish or English, explaining their interest in this educational programme. Candidates may be interviewed personally to assess their suitability, based on motivation adn learning objectives. Those admitted will be requested to pay the amount of 1,000€ as a deposit to reserve a place. • The registration period is open until there are no places left. A maximum number of 20 students will be admitted. • For foreign students, the registration certificate and everything required in orer to apply for a visa, shall be provided once the deposit to reserve a place has been paid. • Asistencia del alumno a las classe y participación en el proceso de enseñanza-aprendizaje: La falta injustificada de asistneica a clase por parte de algún alumno, de forma reiterada o por espacios de tiempo prolongados, debido a su interferencia en su ritmo formativo e incluso en el de sus compañeros, podrá ser motivo suficiente por sí solo para exigírsele la repetición de la asignatura (o varias asignaturas comprendidas en el semestre); o incluso el abandono de los estudios. • Resultados académicos: Baja forzosa por no adquirir las competencias de un curso tras haberlo cursado tres veces. The EHEA framework and new changes in Spanish regulations, require that Spanish universities must ensure the fulfilment of the objectives associated with the lessons taught, in furtherance of continuous improvement. For this reason, the Basque Culinary Center has designed its own system of internal quality assurance in accordance to the principles and guidelines of the AUDIT program of ANECA (National Agency for the evaluation of quality and accreditation). This is a programme for the evaluation of the proposals of official study plans designed in line with the EHEA (European Higher Education Area). A favourable ANECA report is an essential pre-requisite for the degree to become official. This Is a programme available to universities to help the monitoring of official degrees with the aim of validating their correct implementation and results. This is a support programme to universities in the design of their own mechanisms to manage the quality of teaching by university teaching staff, and to promote their development and reputation.